Yesterday, I was invited to sit in on a demo/discussion about behavior-driven development (BDD) with SpecFlow. As a self-proclaimed unit test enthusiast, I was excited right away. I’ve been doing my own, made-up version of BDD for a while. For example, I would have a function that calls several sub-methods. I’d mock the sub-methods and write tests to verify that the sub-methods were called. Then I’d move to the next “layer” by implementing the sub-methods in a similar fashion, repeating until I hit the bottom layer, where the actual work happens. The problem with that approach is that all tested behaviors relate to the code and not business requirements or real-world scenarios. SpecFlow fixes that by using a Gherkin parser, allowing you to write test scenarios using business-readable, domain-specific language instead of code. 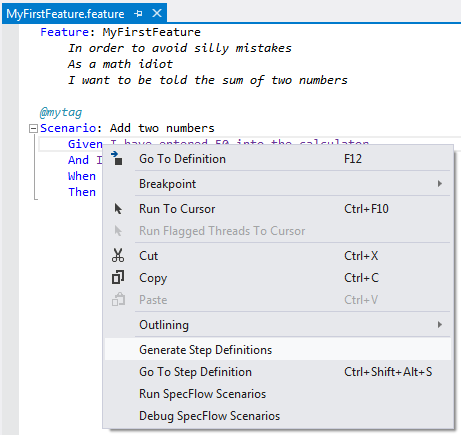 Here’s how you can get started with SpecFlow and Visual Studio. This tutorial is basically a modified version of the Project Setup Guide on the SpecFlow site. I ran into a couple issues with their tutorial, though, and their tutorial also doesn’t get much into implementing the application logic to fix unit tests once they’re generated. 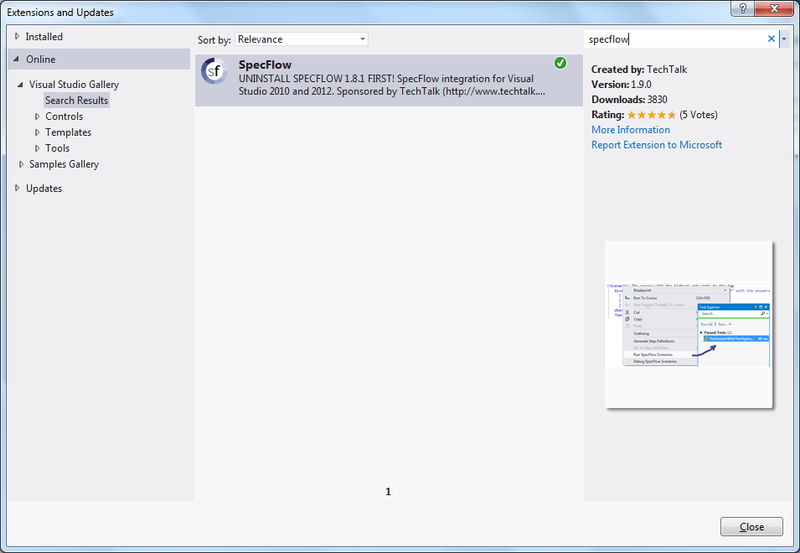 SpecFlow is included in the Visual Studio Extensions Gallery, so installing it is a breeze. Nice, now you’re ready to create your first test project. 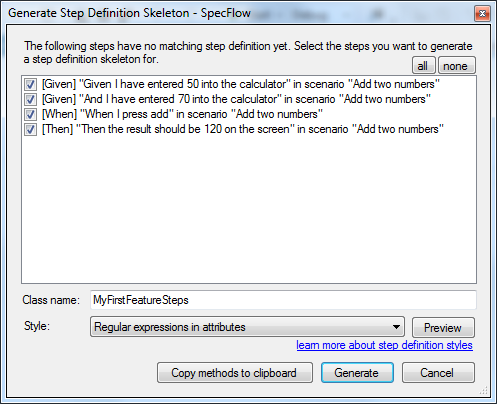 SpecFlow tests are defined as “features” that have multiple scenarios. There is a small amount of project setup that needs to be done, but it’s not too bad and you can be up and running in just a few minutes. That’s it! Now you should have a passing unit test that verifies the business-language requirement. You can add more scenarios to your feature file with different values and/or steps. Note that if you add more steps, you’ll probably need to re-generate step definitions. When you do this, only new step definitions will be generated. 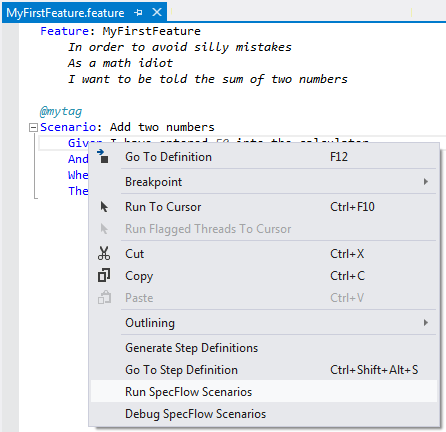 I recommend using the Copy methods to clipboard button in the Generate Step Definitions dialog to avoid overwriting the previously created and implemented step definitions. Thank you. It is very useful and interesting.